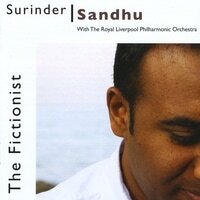 The Fictionist was recorded during 2007 and included Surinder's first Symphony which was commissioned as the theme for Liverpool City of Culture 2008. The album was recorded in the UK and India and featured over 100 musicians. Surinder's biggest production to date. Surinder Sandhu - Sarangi, vocals, djembe and everything else.